Yay!! 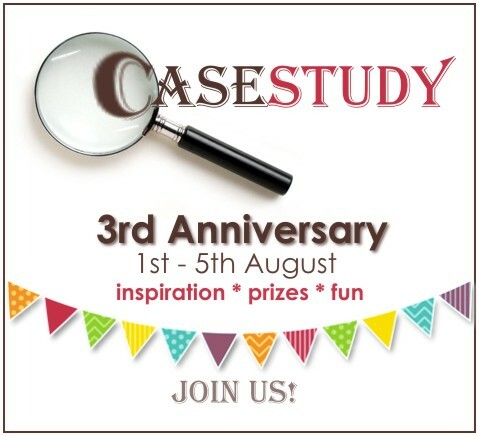 It's CASE Study's 3rd Anniversary!! We have some fun celebrations happening, Chupa has organized a great line up of talent and of course there are some great prizes up for grabs. So, you should have arrived here from my crafty friend's blog, the talented Nina Brackett. The theme for the blog hops is simply 'Inspiration' - we could choose anything that currently inspires us. I've recently be inspired by the mixed media techniques used on cards and also by the use of stencils in this trend, so this was the inspiration for my cards. On my first card I used Distress Inks, stencils and stamps. Starting with white cardstock I positioned the stencils, I used Tim Holtz Mini Mask Florets, these are individual sticky backed stencils that you can arrange to make your own pattern. I used a combo of Picked Raspberry and Mowed Lawn to ink over the stencil with my blending tool, then I removed the stencils and inked with Scattered Straw Distress Ink. Over that I stamped some foliage from Leafy Accents from Clearly Besotted Stamps using Mowed Lawn Distress Ink, I did some repeat stamping without inking the stamp again. 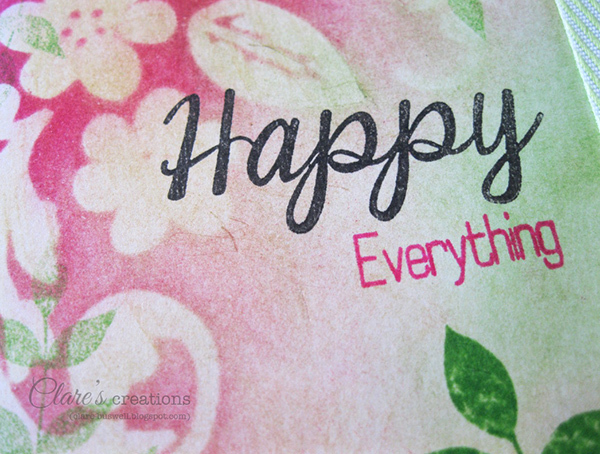 The sentiment stamp is from Happy Everything also from Clearly Besotted Stamps. For my second card I used some Acrylic paint, a stencil, glitter, Distress Ink and a sticker. This time I mixed some acrylic paints to a milky consistency and applied it over the stencil (Ivy Background from Creative Expressions) with a fine sponge, again to white cardstock. While the paint was still wet I sprinkled over some blue glitter for a touch of sparkle. I removed the stencil and left to dry. Once dry I applied some Mustard Seed Distress Ink to the masked areas. The sentiment sticker is from SRM Stickers. I had fun experimenting with the mixed media technique and stencils, I hope you're inspired to give it a try! Next up on the hop is Melyssa Connolly. Don't forget the celebrations continue, the next hop is on the 3rd and again on the 5th!! To be in with a chance of winning one of the prizes (visit the CASE Study blog for all the details) you'll have to leave a comment on each of the participants blogs. All of the blog hops are open until midnight August 7th. Enjoy the rest of the hop!! Beautiful cards, Clare! Such gorgeous combination of colors! You've outdone yourself with these! Amazing work, I especially dig the first one! Need to try this myself. One day... lol! Gorgeous cards! These make me want to get my stencils out and try some of these techniques! Fabulous color combos! These are so beautiful....love how you used stencils! Loving your use of the mixed media platform, and your wonderful design sense! Stencils are something I have begun using too and love to incorporate with traditional stamped images! Wonderful work for the Anniversary Blog Hop!! Wonderful cards!!! love the technique you used! love how your cards turned out with the colors you chose, very pretty!! Wow both of these cards are eye catching but the second one, just brilliant. I have gotto get some stencils and give this a go. I just love my glitter and distress inks. Can't believe I am first to comment!!! Your cards are so beautiful and just love the way you blend your colours. Very inspirational!! Gorgeous and beautiful cards! I love the first card! I love the colors, layout... everything! Your stamping is gorgeous...love both of your beautiful cards! These are gorgeous Clare, I love how you done the inking on the first card so very cute. Gorgeous stamping and techniques! I love especially the first card! 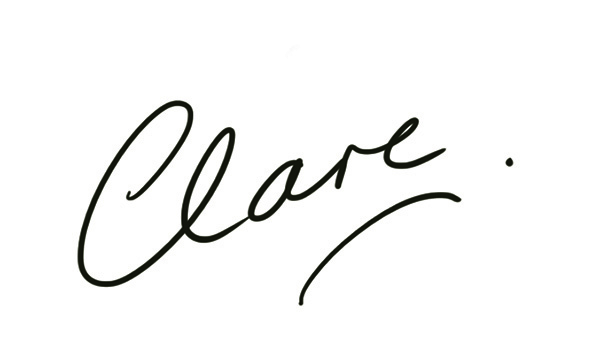 Beautiful stamping, Clare! Wonderful cards! Two very beautiful cards thanks for showing and congrats with the 3th anniversary over at case study. Two beautiful cards and some great techniques! pretty pretty pretty.. love the colors on your cards! TFS! Just lovely cards! The colors are gorgeous, and they are both so soft and pretty! These are so pretty and thanks for the technique tips. Gorgeous cards! Thanks for sharing your inspiration to inspire us! Your stenciling is just gorgeous! Incredible cards, Clare! Love the beautiful inking you did on that first card. Very pretty and a neat trick with the stencil. Elegant beauty. Thanks for sharing. Beautiful projects Clare - like a walk in the garden - so much color and depth! I love the techniqes you used on both cards. Beautiful!!! Love the sparkly blue background! STUNNING creations Clare~I love them both! Gorgeous cards, loving the inking/blending, the first is just beautiful and I love how elegant the second is! Gorgeous cards! Thank you so much for sharing your inspiration and process with us! Both fabulous! the first with the softness if stunning! These cards are so lovely. :) Amazing inspiration. What an amazing blend of colors and shapes. These are fantastic. I especially love layered effect and the beautiful blending of colors on the first. Beautiful cards. Love how you have used the stencils! Sweetness!! I love them both but the first one is my favorite!! You really rocked the stenciling!! After seeing this, I realized that I have neglected my stencils way too long. Now I can use them again, thanks to your inspiring card! Thank you. Both of your cards are simply beautiful. You have inspired me to use more stencils and different media. Love how you used the stencil and the colors combinations. Gorgeous! I just love that second card---stunning! Wonderful use of stencils on these cards...I especially like the elegant first one. Fabulous projects. I just love the color that you have on the second one. These cards are so beautiful. I never heard of those Tim Holtz moveable stencils that you used for the first card. Need to check them out! Beautiful cards! Love the soft elegance of the first one, and the bold contrast of the second! Absolutely love both the cards. The first one is so pretty and delicate. And the second is so bright and cheerful! I love the subtle blue glitter, and the distressing on the ivy. It came out beautifully. I really love the way you achieved that ombre gradiation of colour! Thanks for sharing your talent with us! Works of art, literally, Clare! I'm blown away!! Your first card is so pretty, but I also love the bold colours of your second one. Haven't tried mixed media myself. These are gorgeous. Oh, and that chevron ribbon - I think that's going to sneak in my next order. WOW! I am so impressed with the techniques used. The colors blend so beautifully. I especially love the first card. What beautiful cards!! I love the way you worked with the stencils!! Gorgeous cards! I appreciate that you are embracing current trends!! These are both stunning! I love the first one -I have that same small mask and I never use it -thanks for the inspiration! 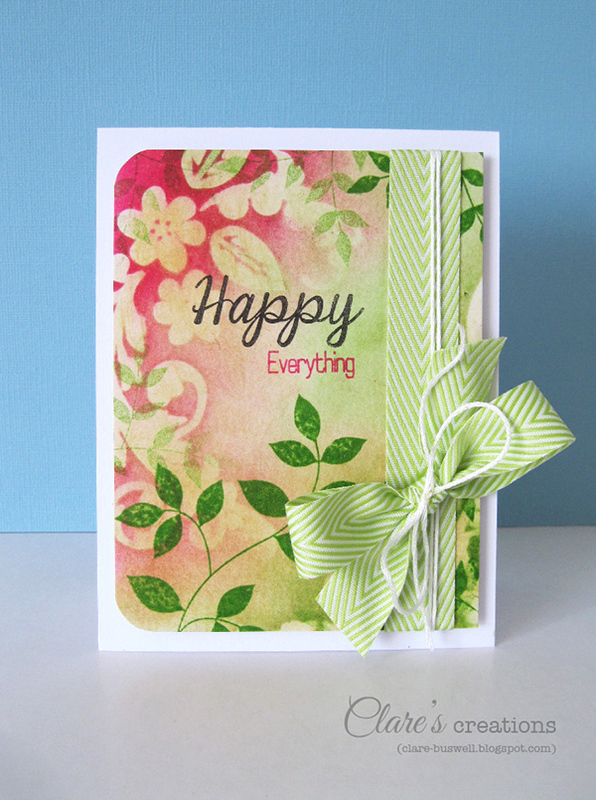 I too love the look of stencils and have been inspired by your cards to get mine out again! Wow this is beautiful!!! I really need to use some stencils!! so pretty!!! I just love that second card, beautiful! I love the colors you used these are both lovely. they are amzing. 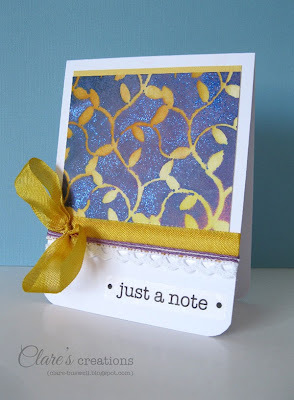 on first card stencil work seems magical and love the stamping over it. My favourite card. Love your cards and your style. Amazing inspiration! It's so fun to see how each designer is inspired and the fun techniques used to replicate their inspiration. wow beautiful cards and i loved how you used stencils, acrylic paint for second card. thanks for inspiring. Beautiful card....Thank you for sharing your inspiration with us!! Awesome cards! Great combination of technique and tool! Must try that someday! Awesome cards! Great combination of technique and tool! Must try that some day! gorgeous stenciling. so soft and pretty. I love how you used the stencils! Fab job! Beautiful cards. Love how you have used the stencils and paint, Claire! Great work! Wow! These are both completely stunning! Clare these look wonderful! loving all the masking, stenciling! Wow love the purple and gold together. It such a beautiful card. I love that you use a stencils. Very pretty cards. Thans for sharing! Pretty cards Clare . I love the colour combination and texture of the first card , and the second card is so stunning . thank you for sharing. I adore the colors you used and how you did the background glitter sounds so awesome and looks amazing! Thanks so much for sharing! A new technique to try - yippeee! I'd better pin it so I can share and find it easily later! Wonderful use of stencils and I love anything with glitter on it! Absolutely perfect combo of that ribbon with those images and their coloring - just gorgeous! Gorgeous! Love the stenciling and the glitter. 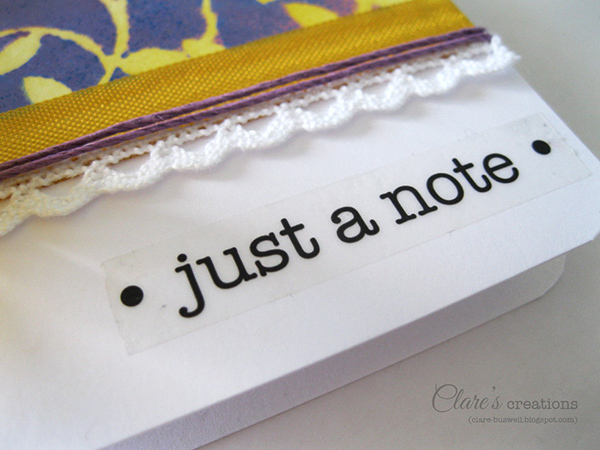 FAB inspiration & GORGEOUS cards Clare!! Such beautiful cards using stencils! Love both!